This is nothing more than a small tin shack which is located on the Jawahar Road on the way to the HMI and Zoo. 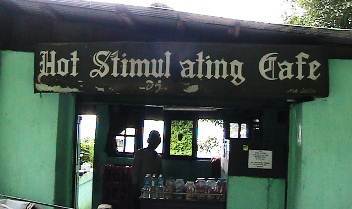 However, you can't probably imagine how many people make Hot Stimulating Cafe a must eat place when they come to Darjeeling. It's a small cafe located on one side of the road having a tinned roof. Unless you are attentive, you will likely miss it as you pass by. The cafe is run by Lily who herself is a cook, and Mr. K Rumba, Lily's husband. However Rumba often gets busy taking tourists out for treks. As you enter, you can walk across to a small open terrace area on the other side that has only one table and a water tank storing drinking water used by the cafe. From the open deck at the backside, the view of the mountains and the valley below is spectacular. Inside on the right is a small kitchenette. On the left is the small and cozy seating area. There are only three wooden tables with benches on the right and three on the left. The tables on the window side have wonderful views of the foot hill and the mountain range, and are the first ones to get filled up. The interior is all wooden including the floor. They often put on lively Hindi music inside. If there are not enough tourists, Lily often takes up one of the front tables for making the momos (vegetarian dumplings) which this cafe is well known for. She uses a still pan for storing the ingredients that comprises of chopped onion, ginger, cabbage, carrots etc. The dumplings are then hand rolled in a half moon shape. So what kind of food do you get here? Essentially vegetarian snack items although some egg items are also offered. You will get Tibetan, Chinese and Indian food like veg. momos, aloo paratha (Indian wheat bread with potato filling and fried), vegetarian chowmein, Thukpa (hot noodle soup), and also cheese burgers, egg burgers, etc. They also serve beverages of different types like masala teas (with cardamom, cinnamon, ginger flavors etc. ), Darjeeling tea, hot chocolate, coffee etc. However one of the drinks that Hot Stimulating Cafe is famous for is Tongba, a homemade beer which they serve on bamboo glass and consumed using a bamboo pipe. Lily told me that it is only offered to the tourists and not to the local young people. The drink is prepared from millet. It's usually prepared by Rumba's grandmother. You will often find foreigners relishing the beer with hot momos and spending hours at the cafe. Although Lily says the beer is quite light, I have tried it once and found it quite intoxicating :) When I asked her about its potency, she says it's like a light beer with only 8% alcohol in it ... I doubt it though. But it's quite good anyway. I was amazed looking at the fat guest book which Lily forwarded to me. This old book with volumes of pages have endless comments by visitors from all over the world. There are so many intense expressions of love for the place and the food. Many have even drawn pictures to depict their emotions. I was pleasantly surprised to see that many celebrities have also come and enjoyed momos and beverages here in this simple tin shack. You ask Lily, and she will rattle out the names. So does it all mean that Hot Stimulating Cafe is a superlative eatery with a classy touch? By all means no. If you are looking for spotlessly clean place with stylish comfortable seating arrangements, this place won't qualify. If you are however looking for a simple low scale cafe that offers homelike atmosphere with hot homemade food in a light and jolly environment, then it can really be hot and stimulating, and can score well over the others in its category. When I asked Lily about the open hours of Hot Stimulating Cafe, she smiled and said that "We open at 9am but we don't know when we can close. There are days when we had to keep it open until 2am in the morning. The guests keep asking for more beer and momos". Hot Stimulating Cafe is located on Jawahar road, and on the way to the Zoo and Himalayan Mountaineering Institute (HMI). The HMI is some 5 minutes walk from the cafe. You can also walk down from the Mall. It will be about 20-25 minutes walk. 2) Visit Darjeeling Restaurants Guide for a complete guide to restaurants in the hill town.